GOM with presents its metrology CT at CONTROL that provides 3D data of internal and external part geometries in exceptionally high resolution. 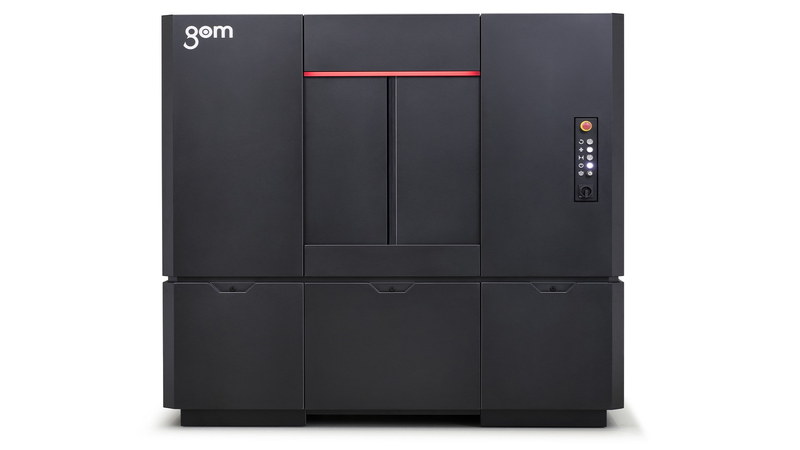 The GOM CT visualizes the finest details of the entire component, simplifying initial sample testing, tool correction and inspection tasks during ongoing production. Capturing complex components including their inner structures in one scan, the system provides the user with a complete digital replica of the specimen for GD&T analyses or nominal-actual comparisons. The computer tomograph particularly excels in digitizing small plastic and light metal parts. In order to achieve a very high detail sharpness during the digitization of parts, the GOM CT was built of perfectly matching components: The high-contrast 3k X-ray detector generates a very fine grid of pixels (3008 x 2512 pixels) and thus lays the foundation for high-precision part acquisition. The 5-axis kinematics with an integrated centering table makes it easier for the user to optimally position the part in the measuring volume, so that the measurement is always carried out in the best possible resolution. A practical feature is that within the measuring area (diameter: 240 mm, height: 400 mm) several objects can be measured simultaneously in one scan, which further shortens processing times. Due to the high inherent rigidity of the system, the measuring results are highly accurate and repeatable. The control of the device and the metrological evaluation of the data are combined in a single software package, as is typical for GOM. This means that no additional software is required; the process chain from recording the raw data to creating the measuring report is significantly simplified.